- Developers of hardware and software solutions for users who are blind, deaf-blind or have low vision. In 2017 our products are on the way to the world market. - Distributors for world leading AT companies in Russia and CIS. We can offer a single solution as well as task-oriented bundles. - Creators of educational e-learning project ElSchool. We not only develop and sell assistive technologies but teach people how to use them. - Providers of employment opportunities for people with Visual impairments. We have blind programmers, localizers and tech support personnel at Elita Group. We know the needs of our customers. About 50% of our staff members have visual impairments. So, we use our solutions on a daily basis. ElBraille is a portable device designed for users who are blind or deaf-blind and want to stay connected at school, at workplace or home as well as on the go. A user can utilize braille and/or speech for output and braille for the input. The device supports Windows 10 functionality, including third party applications accessible with JAWS. ElBraille has specially designed software installed on it as well. 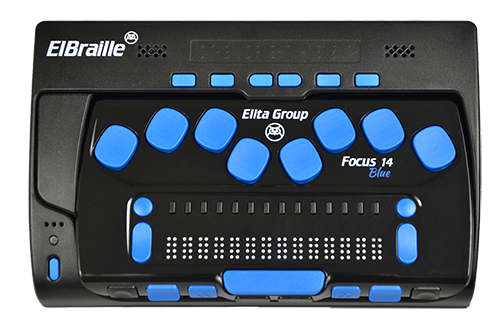 ElBraille is powered by Windows 10, JAWS 18.0 screen reading software and a Focus 14 Blue Braille display. ElBraille is a full-featured portable PC. It will allow its owner not only to quickly create notes and read e-mail, but also work in popular Microsoft Office apps, surf the Internet with a wireless connection, and perform all of his/ her current everyday tasks. The ElBraille was designed to meet all of these needs and more. It is a 21st century notetaker. In one solid device it has everything its owner needs to excel in school and work. ElPicsPrint software is designed for preparing and embossing images on Braille embossers manufactured by Index Braille. A tactile image is a source of information about the object drawn on the image for those who explore it with fingertips, just like a usual image in full color is such a source for a sighted user. With ElPicsPrint you will be able to prepare and emboss an image that will be clear and comfortable for using by blind customers. ElPicsPrint allows you to make a tactile illustration to any section of a textbook, to create your own illustrated books for kids of preschool and school age, to emboss an outline of a university campus and much more. 14-days evaluation period is available for those who would like to try ElPicsPrint in full-featured mode. Installed copy of the software contains a set of pre-designed tactile samples which you can use for testing ElPicsPrint’s features. 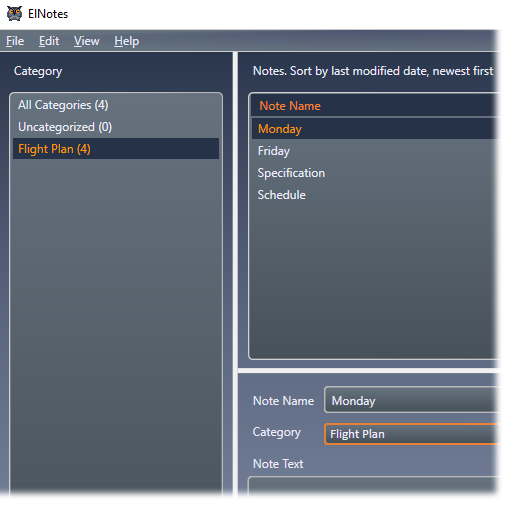 ElNotes is a Windows based application. It was designed for creating, storing and managing text and voice notes. ElNotes allows a user to quickly create text and voice notes using a set of special keystrokes and then export them to txt or mp3 files respectively, if needed. These files are saved to a folder chosen by user and then are available to be read and listened to using other Windows applications. Notes can be sort by categories making it easier to organize its owner's information. Search feature allows to quickly find a note or an important text inside it. You can download ElNotes and use it in full-featured mode for 30 days. Activation is required after evaluation period expires.